Today's boat electronics help keep you safe, allow communications, help find fish and provide navigation. The truth is you can go fishing and not use add on electronics. However, the more fish you want to catch, the further you travel and the larger the water you fish - the more important fishing electronics become. 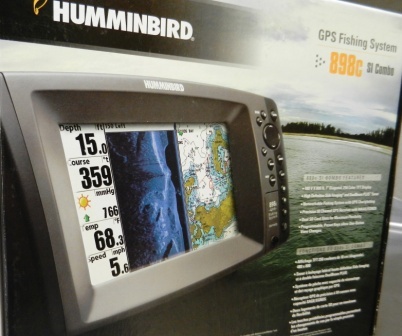 If your boat becomes dead in the water the marine radio shown below can become very important. In addition, boat lights are mandatory if on the water before sunrise or after sunset. These topics and more have devoted page links below. COBRA MRF45D Marine Radio - 2-Way Submersible Long Range Fixed Mount Class-D DSC with NOAA Weather Alerts, 1 or 25 Watt Selectable Output VHF Radio, Illuminated Display & International Coverage for USA/Canada We have devoted an entire page to marine VHF radios, click on the link below. As an Amazon Associate we earn from qualifying purchases. Items we recommend have been personally tested or we have fished with anglers who were using them. There are many features available when looking at Depth Finders . There are also many different levels of clarity to choose from. Older models do a nice job of identifying the depth or bottom of the lake, but new models offer more clarity, color, and many will combine depth reading alongside of GPS readings. Today's models offer side imaging, high definition, down imaging and also links to many of the modern trolling motors in order to travel along a shoreline at a specific depth.